A recent haul by Barnhart involved one of the most enigmatic particles in the cosmos. Barnhart was hired to receive and transport two neutrino detectors, which were shipped from Europe. A neutrino detector is designed to capture and inspect neutrinos, neutral subatomic particles that, while abundant in the universe, are little known or understood. Barnhart received the detectors at a port in Burns Harbor, Indiana from ships gear to 14 lines of THP trailer. They were staged onsite while resting on the trailers. 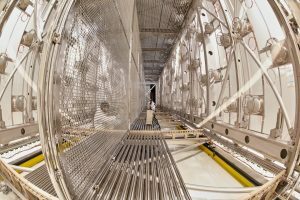 From the outside, the two detectors looked like extra-large shipping containers, but inside the walls were lined with incredibly delicate panels of wires. The detectors were so fragile, impact sensors were installed to measure if the irreplaceable detectors met any unexpected disturbances. Transportation of the detectors to their eventual destination in Batavia, Illinois began once the permits were approved by the Indiana and Illinois DOT. Due to the fragility of the cargo, the detectors had to be moved on a Goldhofer trailer to limit the amount of deflection and required precise shimming when loaded. 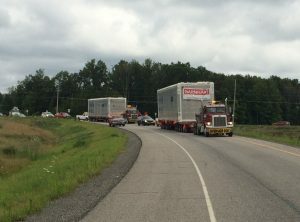 They also needed to be continuously supported during the transport, while traveling at reduced speeds. The convoy traveled at a reduced speed. Since the shells of the detectors were aluminum, Barnhart had to ensure that their securement chains did not make contact and damage the shells. In addition, the crew had to ensure that all trees along the route were sufficiently trimmed back to eliminate the risk of damage due to contact with limbs. Representatives from the detector’s manufacturer met the convoy every time it stopped to check the shock sensors and verify that handling instructions were being followed. While the trip was only 250 miles, it took three days for the cargo to reach its destination, a lab outside Chicago. The detectors will eventually be installed inside a specially-constructed building specifically outfitted for them. This entry was posted in Heavy Haul and tagged Goldhofer, Heavy Haul, neutrino detectors, THP Trailers. Bookmark the permalink.